Brock's EVEREST® E-Series Grain Silos offer the tallest eave heights in the industry along with higher grain-holding capacities and enhanced roof peak load strength. Brock's unique EVEREST® SUMMIT SYSTEM™ enables installers to make efficient, uniform connections of LeMar™ Catwalk and Tower Support Systems to the EVEREST Silos. Brock's unique FULL SWEEP™ Silo Anchoring System (patent pending) allows for the safe operation of single-pass sweeps in all Brock EVEREST Grain Storage Silos. Elevate your grain storage to greater heights and larger capacities! Brock’s EVEREST® E-Series Grain Silos offer the tallest eave heights in the industry along with higher grain-holding capacities to help meet the storage challenges presented by trend-line grain yield increases. Brock has now also added high-capacity storage models to its line of EVEREST Silos. The new silo models are 40.2 m and 47.5 m (132- and 156-feet) in diameter and offer maximum storage capacities of up to 41,260 and 43,070 cubic meters (1.24-million and 1.3-million bushels) respectively. In addition to scaling to greater heights and the capacity to store more grain, the E-Series design features innovative changes to roof structure, body sheets, silo stiffeners, anchoring systems and accessories while also meeting or exceeding new grain industry standards. A new peak support connection is also available. Brock’s unique EVEREST SUMMIT SYSTEM™ efficiently and uniformly connects the silos with LeMar™ Catwalk And Tower Support Systems. This new system provides pre-engineered connection points for LeMar's products and are appropriate for the uniform weight distribution of roof-top equipment on the roof structure. The system also saves time and labor during installation by eliminating the traditional practice of cutting and resealing holes in the silo roof in order to install equipment at the roof peak. ENHANCED ROOF PEAK LOAD STRENGTH – UP TO 130,000 POUNDS! The EVEREST Silo line offers greater roof peak loading capacities – up to 59,000 kg (130,000 pounds) with a uniformly-distributed pure vertical load depending on silo diameter and model. This load capacity is based on 146 kg per square meter (30 pounds per square foot) ground snow load. Brock’s EVEREST Silos do not stop with just offering higher allowable roof peak loading capacities! A silo’s true strength and integrity is the result of combining the silo’s overall roof, sidewall and silo anchoring design strengths. Allowable roof peak loads for different applications. Ground snow load based on 146, 195, 244 or 293 kg per square meter (30, 40, 50 or 60 pounds per square foot). The professional analysis for roof loads considered both balanced and unbalanced snow loads. Temperature control cable loads based on up to 907 kg (2,000 pounds) per temperature control cable for the taller silos. EVEREST Silos are designed to accommodate the load from multiple temperature cables – check with Brock for the details. Dead load weight of the structure itself which will vary depending on silo diameter and model. This weight is the sum of the silo’s roof structure and roof panels. Silo safety anchor points located on the compression ring. Rafters equipped with safety anchor points at the interior perimeter for in-silo safety. Improved handling of internal forces and pressures generated by the grain. Taller silo models offering more grain capacity -- nearly 14% more storage capacity when compared with previous grain silo models that have the same diameter footprint. Higher roof peak weight loads. 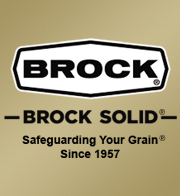 Brock’s HERCULES® Support System that innovatively utilizes the silo’s sidewall stiffeners as LeMar Support Tower connections. Standard feature on all Silos 22 m (72 feet) in diameter and larger. Safely handles normal silo stresses generated during single-pass sweep operation. Saves time, reduces labor and eliminates the need for silo entry during the sweep process. Firmly reinforces the bottom-tier sidewall body sheet to anchor the silo and to prevent moisture penetration. The one-piece outer door opens wide to latch securely against the side of the silo. The door's three or four inner panels open in sequence from top to bottom with a simple lift of the patented latches. No tools are required. Meets recommendations for silo entry, rescue and safety standards. Efficient vertical seam patterns provide improved strength for body sheet connections in both narrow- and wide-corrugation silo models. Thicker body sheets (up to 5 gauge) resulting in fewer laminated sidewall panels and more efficient use of optimal sidewall thicknesses at all levels of the silo. Standardized 9.525-mm (3/8-inch) diameter bolts on narrow-corrugation sidewall connections provide more efficient connections and fewer hardware sizes in assembly.